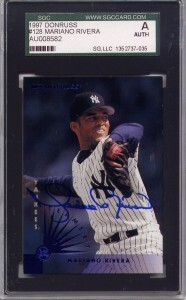 GradedSports.com has just added a great new group of 15 SGC Certified Authentic autographs from New York Yankees recently retired all-time saves leader Mariano Rivera. Certified Authentic autographs make a great gift. We also stock a great selection of over 400 PSA/DNA Certified Hall of Fame signed sportscards from Football, Basketball, Hockey and Golf. All at great discount prices! Great quantity discounts starting at just $100 or more. This entry was posted in Graded Sports Autographs and tagged mariano rivera auto, mariano rivera autographs, mariano rivera cards, psa/dna autographs, SGC certified authentic autographs, signed mariano rivera. Bookmark the permalink.